Collards are an amazing Southern food. My great-grandfather grew collards in his South Carolina garden and passed down the heirloom seeds to our family. My mother grew these collards and fed them to us every year. She even made them into baby food when my brother was little. Low in calories and high in non-dairy calcium, vitamin A and vitamin C, collards are just plain good for you. I especially liked the savory/sweet combination of these greens. I make a lot of recipes. Unless the recipe is really awesome, I don’t make it over again. I plan to make this again and again and again. Rinse greens and drain well. Saute onion in the oil and bacon grease in a dutch oven over medium until tender, about 5 minutes. Add broth, vinegar, brown sugar, red pepper and smoke flavor. Bring to a boil. Add the greens, stirring occassionaly. Continue to boil until the greens are wilted. Reduce heat to a simmer and continue cooking until tender, about 20 minutes. So glad you posted this. Katherine has issues with the bitterness of greens sometimes and her dad suggested vinegar as a trick to cut it. I love greens. She likes turnip greens, but other ones have been trickier. These look wonderful. Having grown up in Texas, collard greens were eaten way more than spinach. You are a girl after my own heart…not everyone likes them let alone knows how to cook them. My family LOVES greens and I have never prepared them this way. 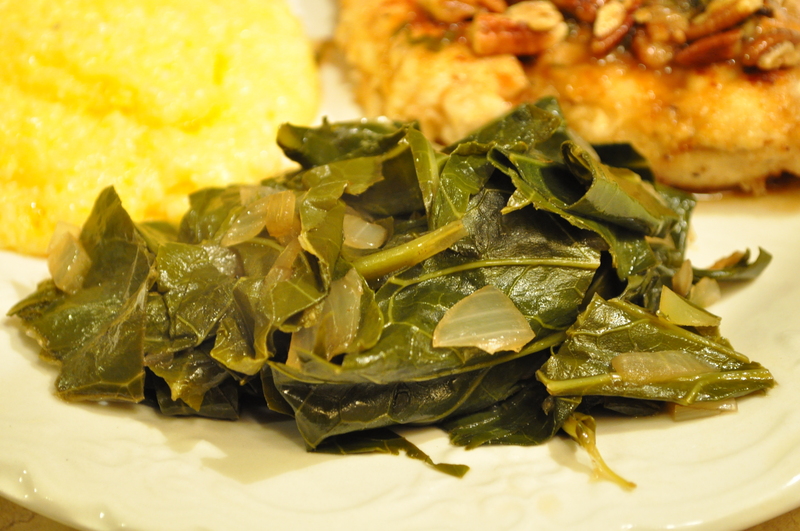 I am going to have to run out and get some Collards today and give this a try. Thanks! Collards are a wonderfully hardy winter green. Let me know how the recipe turns out for you!